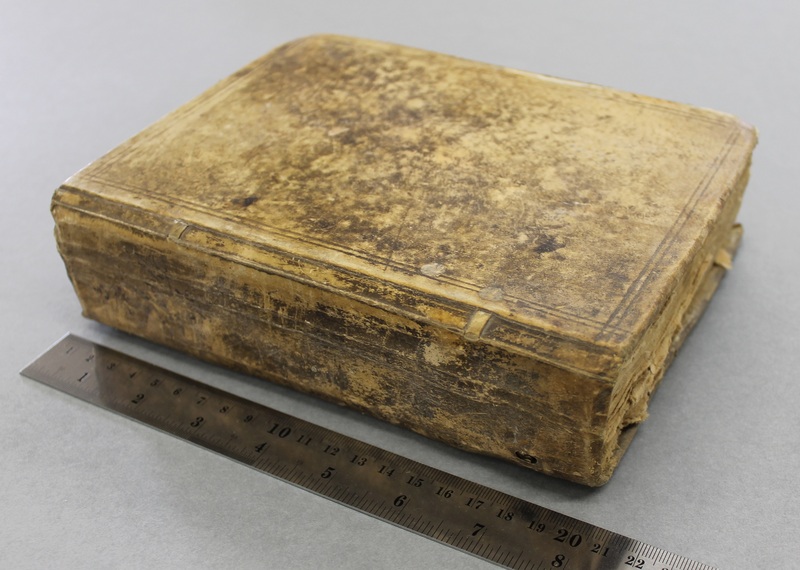 This treasure is a 15th century Book of Hours (D5649/1) which once belonged to the Stathum and Sacheverell families of Morley. It was chosen by a member of our Focus Group. The Book of Hours is the most common type of surviving illuminated manuscript. Most contain a similar collection of texts, prayers and psalms, often with appropriate decorations, for Christian devotion. Illumination or decoration is minimal in many examples, often restricted to decorated capital letters at the start of psalms and other prayers, but books made for wealthy patrons may be extremely lavish, with full-page miniatures. Books of hours were usually written in Latin (the Latin name for them is horae), although there are many entirely or partially written in vernacular European languages, especially Dutch. The English term primer is usually now reserved for those books written in English. Tens of thousands of books of hours have survived to the present day, in libraries and private collections throughout the world. 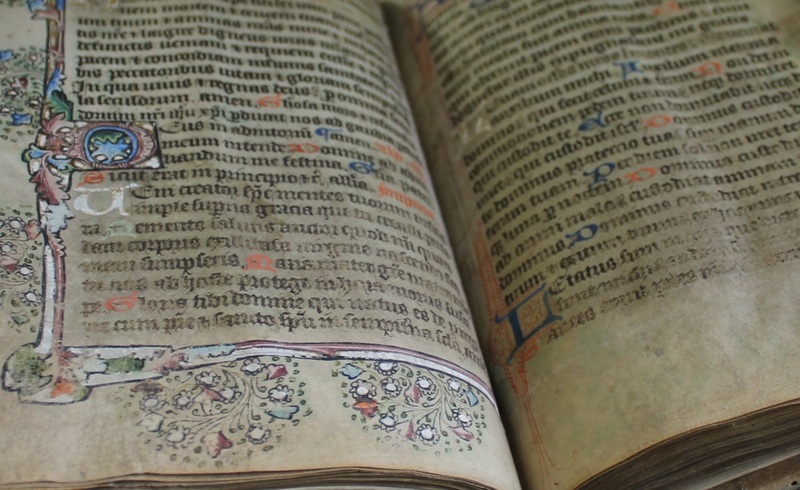 The book of hours has its ultimate origin in the Psalter, which monks and nuns were required to recite. A psalter is a volume containing the Book of Psalms, often with other devotional material bound in as well, such as a liturgical calendar and litany of the Saints. Until the later medieval emergence of the book of hours, psalters were the books most widely owned by wealthy lay persons and were commonly used for learning to read. Many Psalters were richly illuminated and they include some of the most spectacular surviving examples of medieval book art. Discover the world of Randolph Douglas, escapologist, engineer, skilled miniaturist, model maker and extensive collector. Douglas was a talented performer of “self-liberating” illusions and became a friend of contemporary escapologist Harry Houdini during the early part of the 20th century. 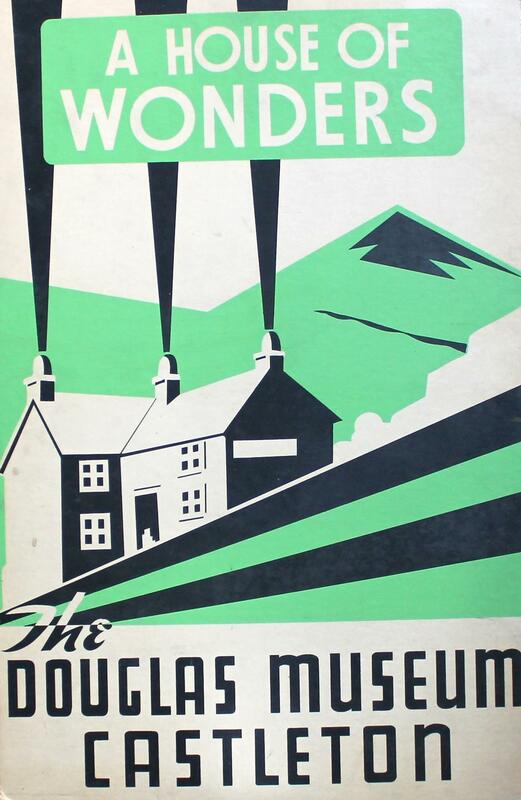 Douglas established The House of Wonders museum at Castleton, where he displayed a collection of curiosities from all over the world, from geology, natural history and art, to locks and tools of the escapology trade, and intricate miniatures he made himself. In the 1980s Derbyshire County Council bought the Douglas Collection with the kind support of the PRISM Fund and it is now held at Buxton Museum & Art Gallery. The Record Office is delighted to display specially selected highlights from this eclectic collection. The exhibition will be ‘in the wall’ at the Record Office from Thursday 27th November 2014 to Saturday 31st January 2015 – normal opening times apply and it’s free to see! The title on the spine of this volume (our reference D3155/WH/2939) is Confidential Papers on the West India Question. It’s a hefty thing, as you can see from the video below, in which I show point out just four examples of the contents. There are another two in the same collection. Those three volumes form just one section of the papers of the parliamentarian Sir Robert Wilmot-Horton (1784-1841); and his papers are in turn only a part of the enormous archive of the Wilmot-Horton family of Catton Hall in Derbyshire. Sir Robert Wilmot-Horton held the post of Under Secretary of State for the Colonies during a crucial period in the struggle against slavery – after the abolition of the trade, but before the legislation that abolished slavery as an institution. These official papers show how both sides worked hard to lobby parliament on the issue. 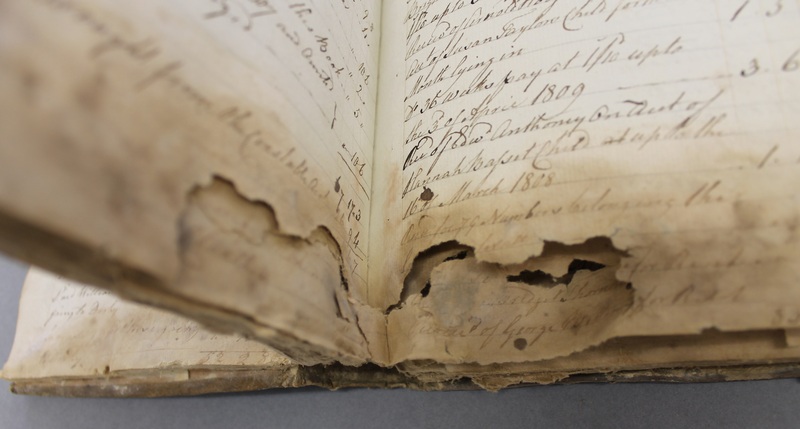 You may have heard that we recently received funding from the National Manuscripts Conservation Trust to conserve some of the rare and important lead mining documents we have in our collections. The lead mining history of Derbyshire is unique – its roots run deep into our local cultural heritage, and its legacy is still visible today in the landscape and traditions of the Peak District. Much of the written material which relates to this important part of our history is held here at the Record Office. 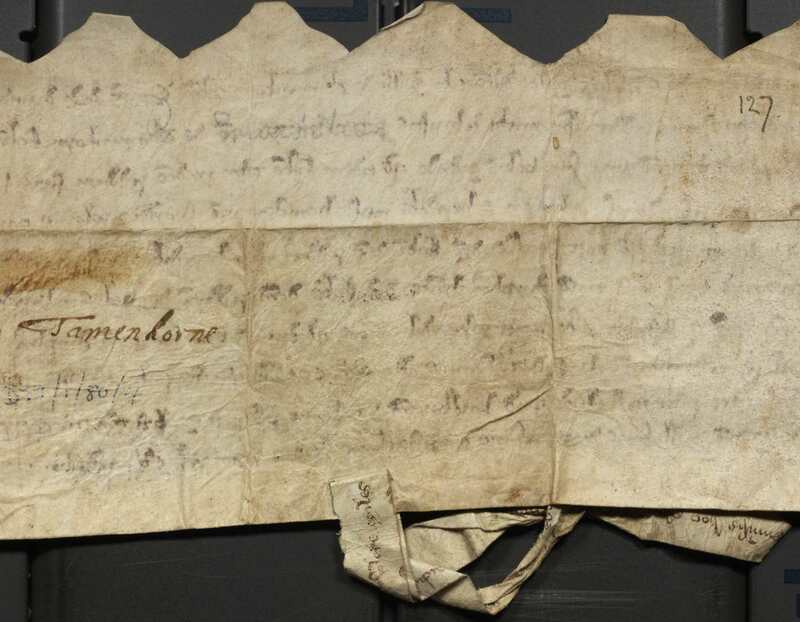 With the help of lead mining researchers we have identified the most important documents which are in need of attention. 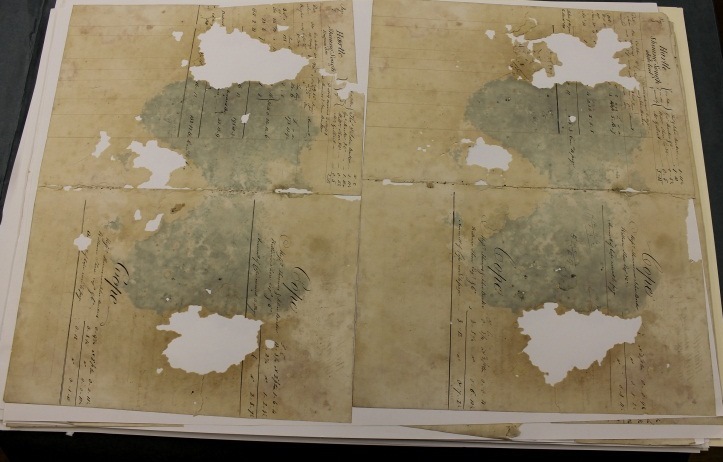 These documents have been severely damaged by damp and mould, and many of them are falling to pieces, which means they are in no fit state to be handled (or even digitised) and are currently unavailable to researchers. Its up to us to ensure their survival – without vital conservation work they would never be seen, and the information contained within them would be lost forever. 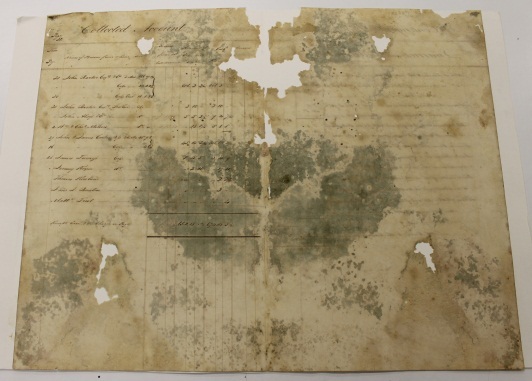 As project conservator on the Mining the Archives project, its my job to carry out the conservation work on the documents. 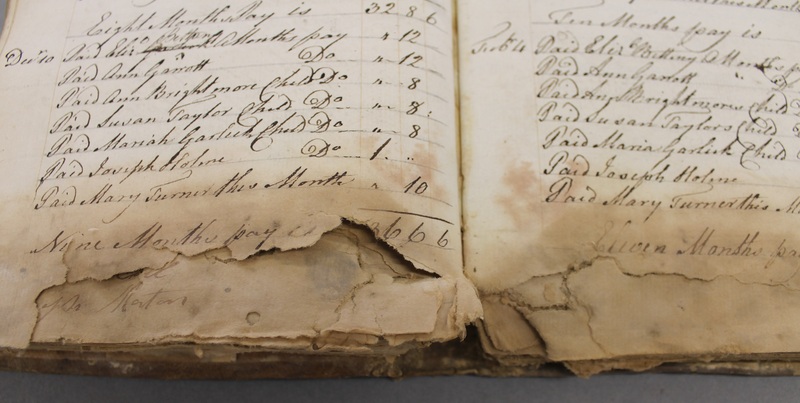 Last week I began the first part of this work – repairing D248: Barmaster’s Lot and Cope account books, 1831-1870. Help the Campaign to provide greater access to important historical works through copyright law reform. Derbyshire Record Office’s 50 Treasures project began in 2012 as a way of marking our fiftieth anniversary. 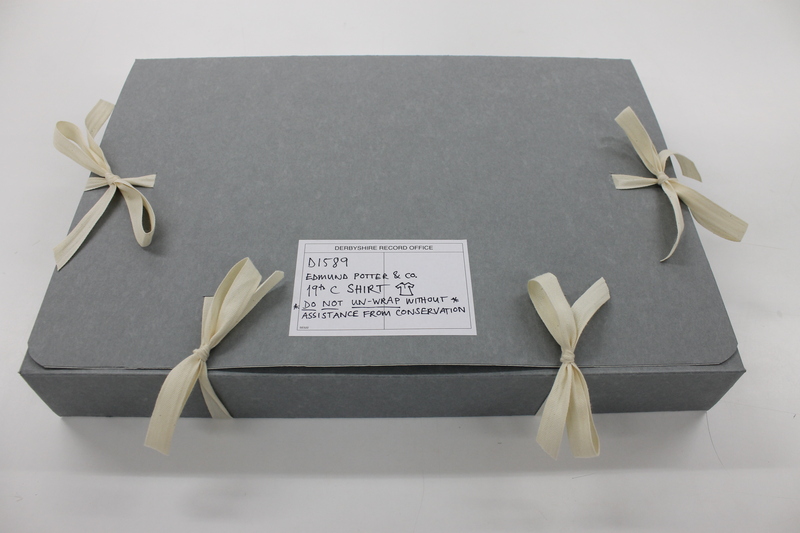 Each treasure has been chosen from our archive and local studies collections because it holds special meaning for one of our staff or users. 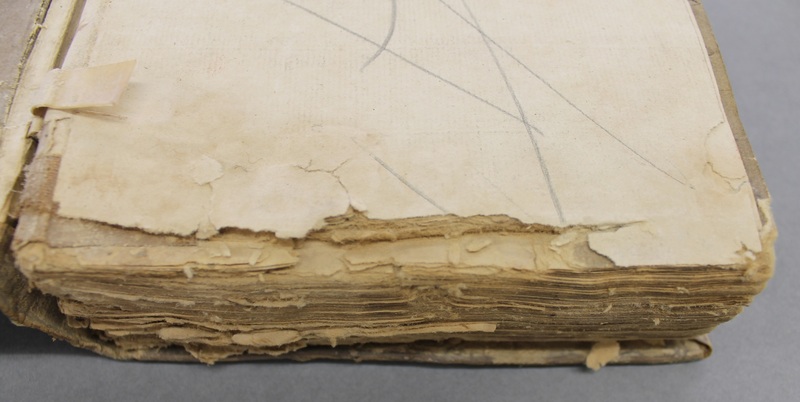 The first treasure, however, is not a single item, but the attractive bindings that do the important job of holding pages together. And they are lovely, aren’t they? Would anybody like to have a go at writing occasional pieces for this lovely blog of ours? We have started up a Guest Bloggers page (you will find it on the menu under Treasure!). Just now, it contains some of the posts written by our work experience people as they have come and gone, but it would be terrific to get some regular contributors. All you really need is an interest in the history of Derbyshire and a willingness to have a go. If you are a user of the record office in one way or another, that would be a bonus. Perhaps you are doing your family tree, or a history of your village, and would like to pass on tips to others in the same boat? Maybe you are an avid reader of books by local authors and would like to write a review or two? Or your angle could be something totally different. Drop us a line at record.office@derbyshire.gov.uk if you are interested. 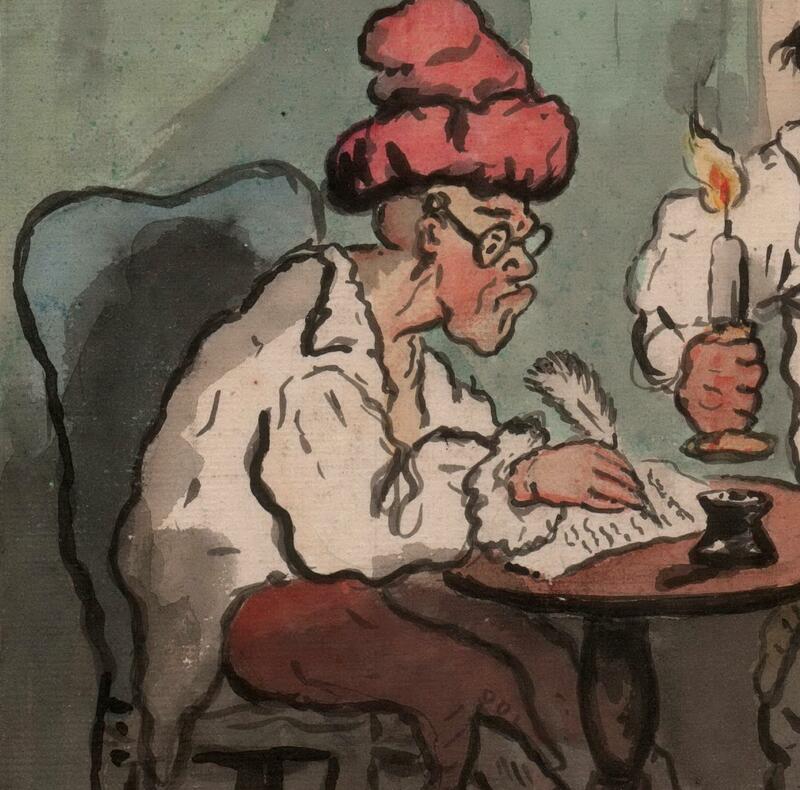 PS – Yes, I know you can’t blog with a quill pen. But I couldn’t resist the urge to illustrate this post with one of George Woodward‘s wonderful cartoons. A few weeks ago we blogged about the Beatrix Potter connection with our collection of archives from her grandfather’s printing company, Edmund Potter & Co, Calico Printers of Dinting Vale, Glossop (D1589). 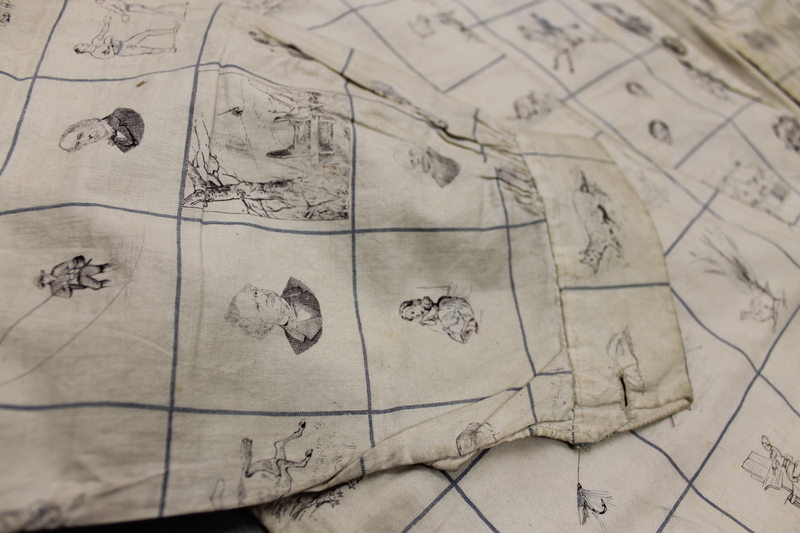 The collection contains some beautiful original pattern books, and also a rather amazing shirt which we think dates from around 1883. 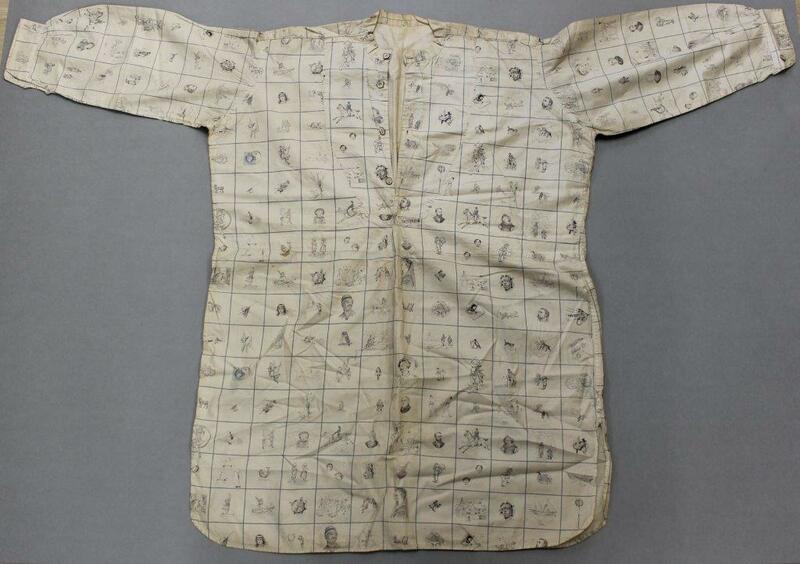 The shirt was found in one of the archive boxes, folded up and stuffed into an old brown envelope – an entirely unsuitable way of storing such a unique and historic item. 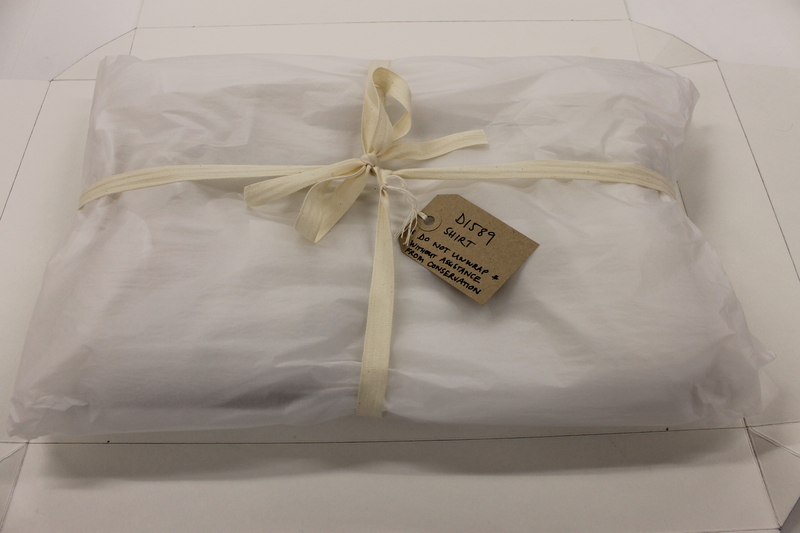 The conservation team have now re-packaged the shirt by carefully wrapping it in acid-free tissue, supporting the folds using conservation padding, and making a made to measure box out of acid-free archival box-board for it to live in. 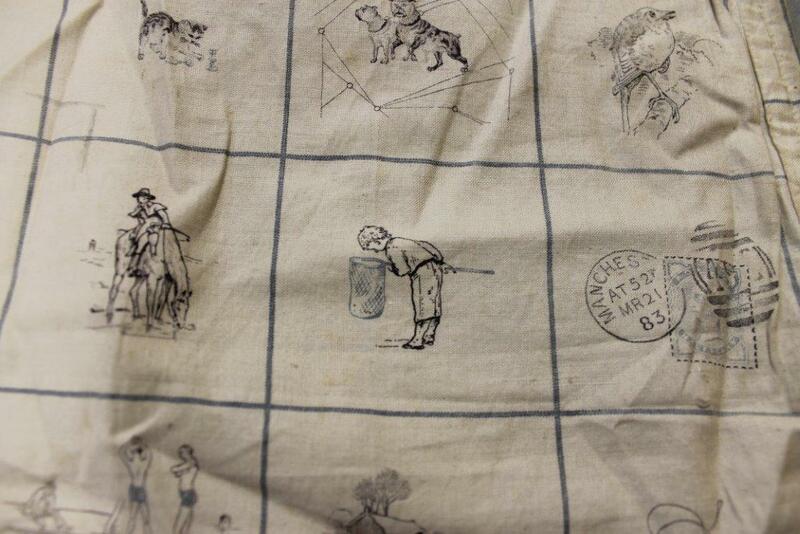 We think such a lovely item is worthy of such care and attention (much better than being stuffed in an envelope!) don’t you agree?